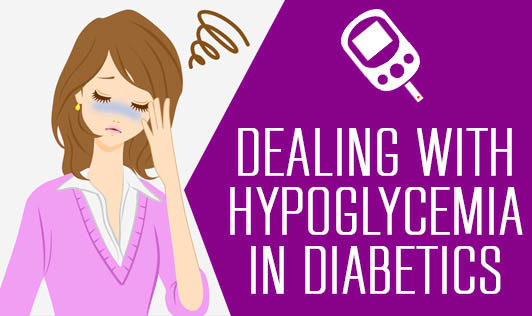 Hypoglycemia is a clinical condition most commonly seen in people with diabetes. It is characterized by low blood sugar levels, usually less than 70mg/dL. What are the causes of hypoglycemia in diabetics? How does one diagnose hypoglycemia? • Do Self monitoring of blood glucose (SMBG)- Regular self monitoring of blood glucose levels with a glucometer will help you identify the onset of symptoms and avoid hypoglycemia. • Eat Regularly- Eating every 2 hours will prevent your blood sugar levels from going down. • Alcohol- Heavy drinking session causes hypoglycemia, so avoid it. Keep your alcohol intake within the recommended limits and always eat something after and with your drink. • Exercise- Always eat something before any kind of strenuous exercise. Preferably try and include a meal that has a good mix of fibre and starch. • Be ready- Patients with type1 diabetes should always carry a container of fruit juice or keep a small packet of sugar in the bag, in case of an emergency. A proper diet regimen with regular follow ups with your doctor will definitely help you keep hypoglycemia away.